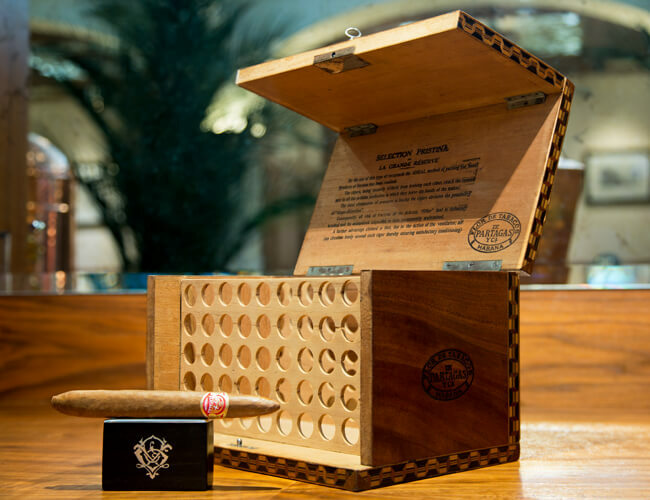 With this humidor, the ideal method for the conservation of Havana’s finest creations was born. The Cubans constantly develop new conservation techniques of their humidors, both in ingenuity and technic. The cigars, are perfectly protected and secured to avoid damage or mold. It is to guarantee that they reach the consumer in pristine condition just the way they left the hands of the torcedor. The total elimination of pressure in boxing the cigars removes the possibility of shape distortion. Consequently, all risk of breaking the delicate wrappers are avoided and unimpaired alignment is also permanently maintained. Another advantage of the design is the convection generated by the vents which help air circulate freely and evenly around each cigar securing the perfect storing conditions. Its opening, reminiscent of an old American car of the same era, prevents the cigar from being handled incorrectly, each vitola can be taken out without disturbing the others. Made with great care and attention to detail, the humidor’s marquetry is made again in Cuban style !